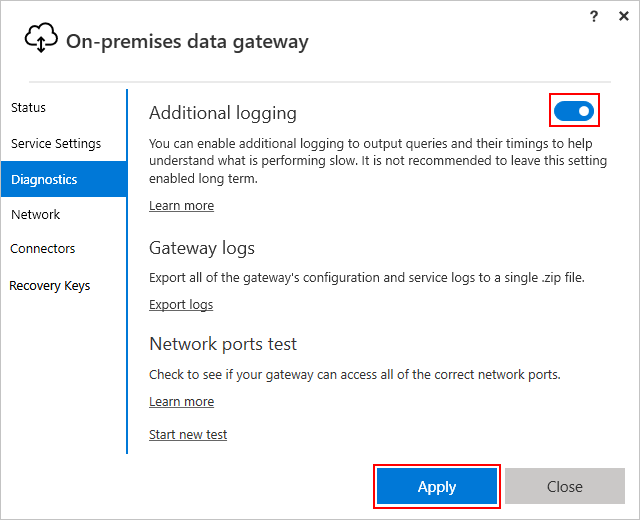 Before you can connect to on-premises data sources from Azure Logic Apps, download and install the on-premises data gateway on a local computer. The gateway works as a bridge that provides quick data transfer and encryption between data sources on premises (not in the cloud) and your logic apps. This article shows how you can download, install, and set up your on-premises data gateway. 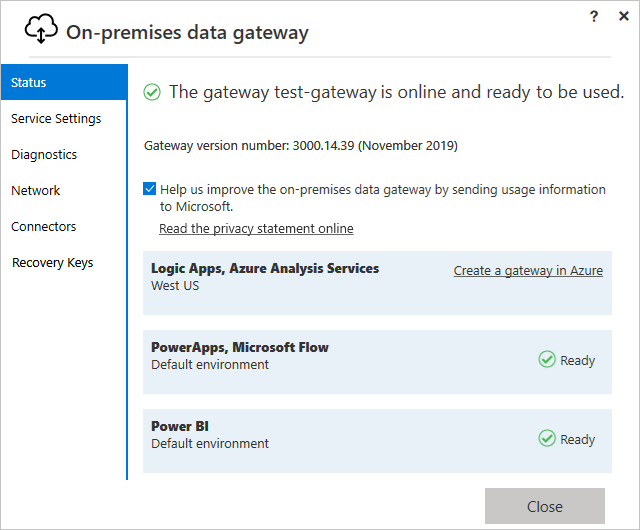 You can use the same gateway installation with other services, such as Power BI, Microsoft Flow, PowerApps, and Azure Analysis Services. Learn more about how the data gateway works. During gateway installation, you sign in to this account so you can associate the gateway installation with your Azure subscription. Later, you also use same account when you create an Azure resource for your gateway installation in the Azure portal. If you don't have an Azure subscription yet, sign up for a free Azure account. You can install the on-premises data gateway only on a local computer, not a domain controller. However, you don't have to install the gateway on the same computer as your data source. Also, you need only one gateway for all your data sources, so no need to install the gateway for each data source. To minimize latency, you can install the gateway as close as possible to your data source, or on the same computer, assuming that you have permissions. Install the gateway on a computer that's connected to the internet, always turned on, and doesn't go to sleep. Otherwise, the gateway can't run. Also, performance might suffer over a wireless network. During installation, you can only sign in with a work or school account that's managed by Azure Active Directory (Azure AD), for example, @contoso.onmicrosoft.com, and not an Azure B2B (guest) account or a personal Microsoft account, such as @hotmail.com or @outlook.com. Make sure you use the same sign-in account when you register your gateway installation in the Azure portal by creating a gateway resource. 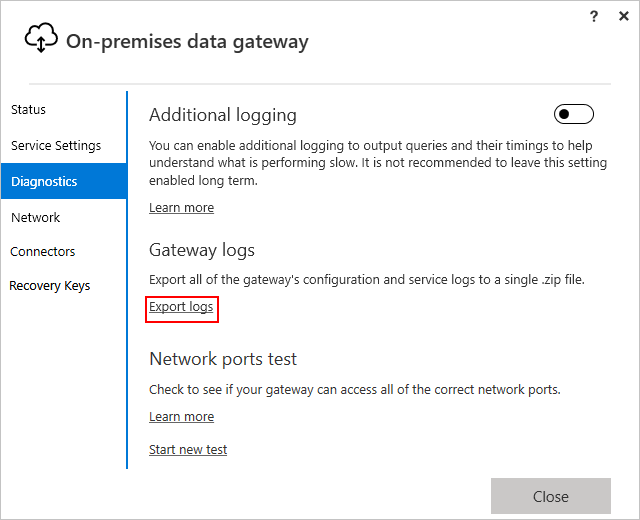 You can then select this gateway resource when you create the connection from your logic app to your on-premises data source. Why must I use an Azure AD work or school account? To use a Microsoft account that has a Visual Studio Standard subscription, first create a directory (tenant) in Azure Active Directory, or use the default directory, with your Microsoft account. Add a user with a password to the directory, then give that user access to your subscription. You can then sign in during gateway installation with this username and password. The region you select for your gateway installation determines the location where you later register your gateway in Azure by creating an Azure resource. When you create this gateway resource in Azure, you must select the same location as your gateway installation. The default region is the same location as your Azure AD tenant, which manages your Azure account, but you can change the location during gateway installation. If you already have a gateway that you set up with an installer earlier than version 14.16.6317.4, you can't change your gateway's location by running the latest installer. However, you can use the latest installer to set up a new gateway with the location you want instead. If you have a gateway installer that's earlier than version 14.16.6317.4, but you haven't installed your gateway yet, you can download and use the latest installer instead. 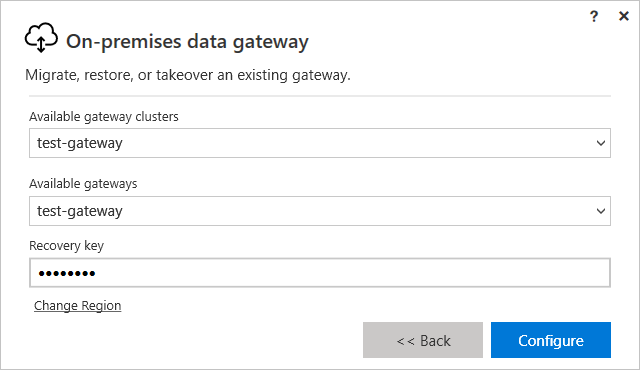 The on-premises data gateway supports high availability when you have more than one gateway installation and set them up as clusters. If you have an existing gateway when you go to create another gateway, you can optionally create high availability clusters. These clusters organize gateways into groups that can help avoid single points of failure. Also, all on-premises data gateway connectors now support high availability. You must already have at least one gateway installation within the same Azure subscription as the primary gateway and the recovery key for that installation. Your primary gateway must be running the gateway update from November 2017 or later. After meeting these requirements, when you create your next gateway, select Add to an existing gateway cluster, select the primary gateway for your cluster, and provide the recovery key for that primary gateway. For more information, see High availability clusters for on-premises data gateway. Download, save, and run the gateway installer on a local computer. Accept the default installation path, or specify the location on your computer where you want to install the gateway. After the gateway successfully installs, provide the email address for your work or school account, and choose Sign in. Choose Register a new gateway on this computer > Next, which registers your gateway installation with the gateway cloud service. Save and keep your recovery key in a safe place. You need this key when you change the gateway's location, or when you migrate, recover, or take over an existing gateway. 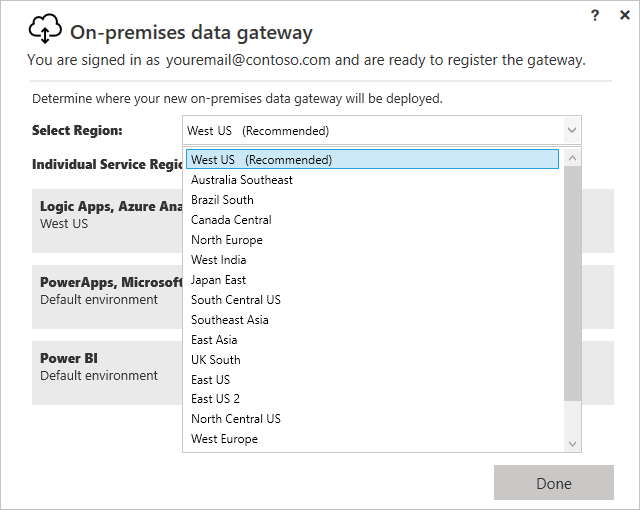 Check the region selected for the gateway cloud service and Azure Service Bus that's used by your gateway installation. To change this region after you finish installing your gateway, you need the recovery key for that gateway installation. Also, you must uninstall and reinstall the gateway. For more information, see Change location, migrate, recover, or take over existing gateway. Why change the region for your gateway installation? For example, to reduce latency, you might change your gateway's region to the same region as your logic app. Or, you might select the region closest to your on-premises data source. Your gateway resource in Azure and your logic app can have different locations. Next to the current region, select Change Region. On the next page, open the Select Region list, select the region you want, and choose Done. After the confirmation page appears, choose Close. The installer confirms that your gateway is now online and ready for use. Now register your gateway in Azure by creating an Azure resource for your gateway installation. If you must change your gateway's location, move your gateway installation to a new computer, recover a damaged gateway, or take ownership for an existing gateway, you need the recovery key that was provided during gateway installation. This action disconnects the old gateway. From your computer's Control Panel, go to Programs and Features. In the programs list, select On-premises data gateway, and then choose Uninstall. Reinstall the on-premises data gateway. After the installer opens, sign in with the same work or school account that was previously used to install the gateway. Select Migrate, restore, or takeover an existing gateway, and then choose Next. Under Available gateways or Available gateway clusters, select the gateway installation you want to change. Enter the recovery key for the gateway installation. To change the region, select Change Region and the new region. When you're done, choose Configure. This command only tests network connectivity and connectivity to the Azure Service Bus. The command doesn't do anything with the gateway or the gateway cloud service that encrypts and stores your credentials and gateway details. Also, this command is only available on Windows Server 2012 R2 or later, and Windows 8.1 or later. On earlier OS versions, you can use Telnet to test connectivity. Learn more about Azure Service Bus and hybrid solutions. If TcpTestSucceeded is not set to True, your gateway might be blocked by a firewall. If you want to be comprehensive, replace the ComputerName and Port values with the values listed under Configure ports in this article. The firewall might also block connections that the Azure Service Bus makes to the Azure datacenters. If this scenario happens, approve (unblock) all the IP addresses for those datacenters in your region. For those IP addresses, get the Azure IP addresses list here. The gateway creates an outbound connection to Azure Service Bus and communicates on outbound ports: TCP 443 (default), 5671, 5672, 9350 through 9354. The gateway doesn't require inbound ports. Learn more about Azure Service Bus and hybrid solutions. *.microsoftonline-p.com 443 Used for authentication depending on configuration. *.msftncsi.com 443 Used to test internet connectivity when the gateway is unreachable by the Power BI service. In some cases, Azure Service Bus connections are made with IP addresses rather than fully qualified domain names. So, you might want to whitelist IP addresses for your data region in your firewall. To whitelist IP addresses rather than domains, you can download and use the Microsoft Azure Datacenter IP ranges list. The IP addresses in this list are in Classless Inter-Domain Routing (CIDR) notation. Otherwise, to find the client location, open the Services console on the same computer, find On-premises data gateway service, and view the Path to executable property. On the computer where you install the on-premises data gateway, the gateway runs as a Windows service account named "On-premises data gateway service". However, the gateway uses the "NT SERVICE\PBIEgwService" name for its "Log On As" account credentials. By default, the gateway has "Log on as a service" permissions on the computer where you install the gateway. 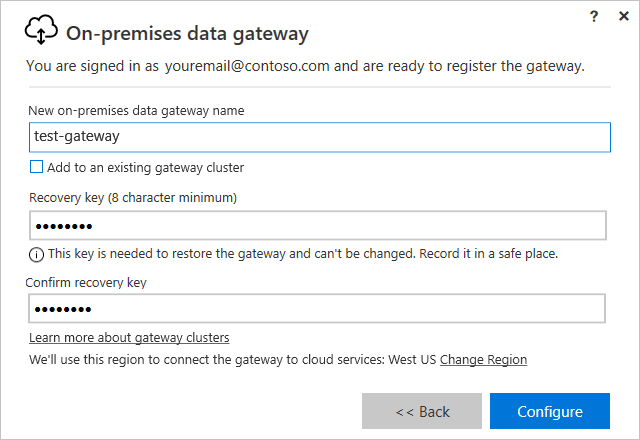 The Windows service account for the gateway usually differs from the account you use for connecting to on-premises data sources, and from the work or school account you use for signing in to cloud services. For you to create and maintain the gateway in the Azure portal, this Windows service account must have at least Contributor permissions. To check these permissions, see Manage access using RBAC and the Azure portal. Currently, there's no single place where tenant administrators can manage all the gateways that other users have installed and configured. If you're a tenant administrator, you might want to have the users in your organization add you as an administrator for every gateway they install. This way, you can manage all the gateways in your organization through the Gateway Settings page or through PowerShell commands. How does the gateway work? The data gateway facilitates quick and secure communication between your logic app, the gateway cloud service, and your on-premises data source. The gateway cloud service encrypts and stores your data source credentials and gateway details. The service also routes queries and their results between your logic app, the on-premises data gateway, and your data source on premises. The gateway works with firewalls and uses only outbound connections. All traffic originates as secure outbound traffic from the gateway agent. 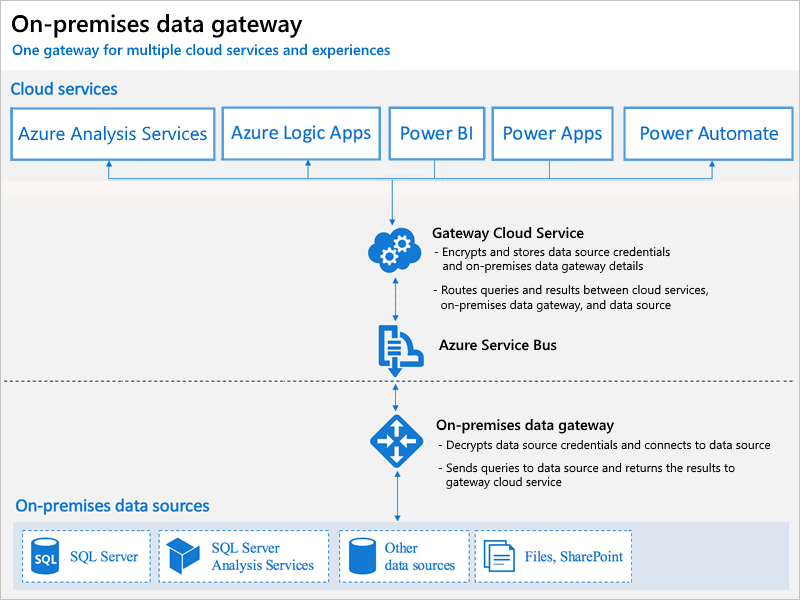 The gateway relays data from on-premises sources on encrypted channels through the Azure Service Bus. This service bus creates a channel between the gateway and the calling service, but doesn't store any data. All data that travels through the gateway is encrypted. The gateway cloud service creates a query, along with the encrypted credentials for the data source, and sends the query to the queue for the gateway to process. The gateway cloud service analyzes the query and pushes the request to the Azure Service Bus. The on-premises data gateway polls the Azure Service Bus for pending requests. The gateway gets the query, decrypts the credentials, and connects to the data source with those credentials. The gateway sends the query to the data source for execution. The results are sent from the data source back to the gateway, and then to the gateway cloud service. The gateway cloud service then uses the results. Q: Do I need a gateway for data sources in the cloud, such as Azure SQL Database? A: No, the gateway connects to on-premises data sources only. Q: Does the gateway have to be installed on the same machine as the data source? A: No, the gateway connects to the data source using the provided connection information. Consider the gateway as a client application in this sense. The gateway just needs the capability to connect to the server name that was provided. Q: Why must I use a work or school account to sign in? A: You can only use a work or school account when you install the on-premises data gateway. Your sign-in account is stored in a tenant that's managed by Azure Active Directory (Azure AD). Usually, your Azure AD account's user principal name (UPN) matches the email address. Q: Where are my credentials stored? A: The credentials that you enter for a data source are encrypted and stored in the gateway cloud service. The credentials are decrypted at the on-premises data gateway. Q: Are there any requirements for network bandwidth? A: Check that your network connection has good throughput. Every environment is different, and the amount of data sent can affect the results. To guarantee a throughput level between your on-premises data source and the Azure datacenters, try Azure ExpressRoute. To help gauge your throughput, try an external tool such as Azure Speed Test. Q: What is the latency for running queries to a data source from the gateway? What is the best architecture? A: To reduce network latency, install the gateway as close to the data source as possible. If you can install the gateway on the actual data source, this proximity minimizes the latency introduced. Also, consider proximity to Azure datacenters. For example, if your service uses the West US datacenter, and you have SQL Server hosted in an Azure VM, then you might want your Azure VM in the West US region too. This proximity minimizes latency and avoids egress charges on the Azure VM. Q: How are results sent back to the cloud? A: The results are sent through Azure Service Bus. Q: Are there any inbound connections to the gateway from the cloud? A: No, the gateway uses outbound connections to Azure Service Bus. Q: What if I block outbound connections? What do I need to open? A: See the ports and hosts that the gateway uses. Q: What is the actual Windows service called? A: On the Services tab in Task Manager, the service name is "PBIEgwService", or Power BI Enterprise Gateway Service. In the Services console, the service name is "On-premises data gateway service". The Windows service uses "NT SERVICE\PBIEgwService" as the Service SID (SSID). Q: Can the gateway Windows service run with an Azure Active Directory account? A: No, the Windows service must have a valid Windows account. Q: What options are available for disaster recovery? A: You can use the recovery key to restore or move a gateway. When you install the gateway, specify the recovery key. Q: What is the benefit of the recovery key? A: The recovery key provides a way to migrate or recover your gateway settings after a disaster. This section addresses some common issues you might have while setting up and using the on-premises data gateway. Q: Why did my gateway installation fail? A: This issue can happen if the anti-virus software on the target computer is outdated. You can either update the anti-virus software or disable the anti-virus software but only during gateway installation, and then enable the software again. Q: Why don't I see my gateway installation when I create the gateway resource in Azure? Your gateway installation is already registered and claimed by another gateway resource in Azure. Gateway installations don't appear in the instances list after gateway resources are created for them. To check your gateway registrations in the Azure portal, review all your Azure resources with the On-premises Data Gateways type for all Azure subscriptions. The Azure AD identity for the person who installed the gateway differs from the person who signed in to the Azure portal. Check that you're signed in with the same identity that installed the gateway. Q: Why did the location for my existing gateway change? A: Gateway resources created before May 3, 2017 were moved to the original locations of the Azure AD tenant for the work or school account that created those gateways. However, these changes shouldn't affect currently running logic apps, which should continue working as usual. With the gateway's general availability in May, gateway resource locations can differ from logic app locations. Q: Where are the gateway logs? A: See the Logs section later in this article. Q: How can I see what queries are being sent to the on-premises data source? A: You can enable query tracing, which includes the queries that are sent. Remember to change query tracing back to the original value when done troubleshooting. Leaving query tracing turned on creates larger logs. You can also look at tools that your data source has for tracing queries. For example, you can use Extended Events or SQL Profiler for SQL Server and Analysis Services. Many issues can surface when the gateway version becomes outdated. As good general practice, make sure you have the latest version. If you haven't updated the gateway for a month or longer, you might consider installing the latest version of the gateway, and see if you can reproduce the issue. You might get this error if you try to install the gateway on a domain controller, which isn't supported. Make sure you deploy the gateway on a machine that isn't a domain controller. To help you troubleshoot, always start by collecting and reviewing the gateway logs. You have several ways for collecting the logs, but the simplest option after you install the gateway is through the gateway installer's user interface. On your computer, open the on-premises data gateway installer. On the left menu, select Diagnostics. Under Gateway logs, select Export logs. 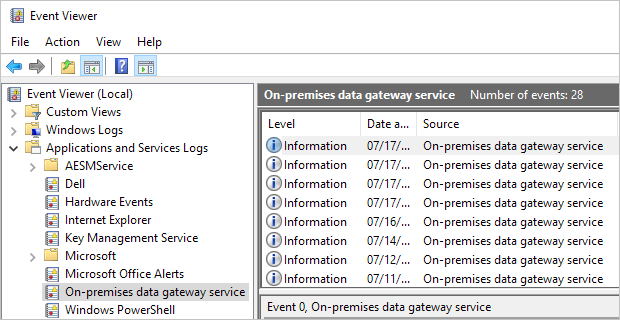 On the computer with the gateway installation, open the Event Viewer. Expand Event Viewer (Local) > Applications and Services Logs. Select On-premises data gateway service. If you find queries run slowly through the gateway, you can turn on additional logging that outputs queries and their durations. These logs might help you find which queries are slow or long running. To tune query performance, you might have to modify your data source, for example, adjust indexes for SQL Server queries. Turning on the EmitQueryTraces setting might significantly increase the log size based on gateway usage. After you finish reviewing the logs, make sure you reset EmitQueryTraces to false again, rather than leave this setting on for the long term. Turning on the TracingVerbosity setting might significantly increase the log size based on gateway usage. After you finish reviewing the logs, make sure you turn off Additional logging in the gateway installer or reset TracingVerbosity to 4 again in the configuration file, rather than leave this setting on for the long term. Export and open the gateway log. MGEQ Queries that run over ADO.NET. MGEO Queries that run over OLEDB. MGEM Queries that run from the Mashup engine. Note the second GUID, which is the Request ID. The "FireActivityCompletedSuccessfullyEvent" entry is a verbose entry and is not logged unless the "TracingVerbosity" setting is at level 5. Fiddler is a free tool from Telerik that monitors HTTP traffic. You can review this traffic with the Power BI service from the client machine. This service might show errors and other related information.